The Pacers have fared well without star guard Victor Oladipo, who's out for the season with a knee injury, but can they keep it up? 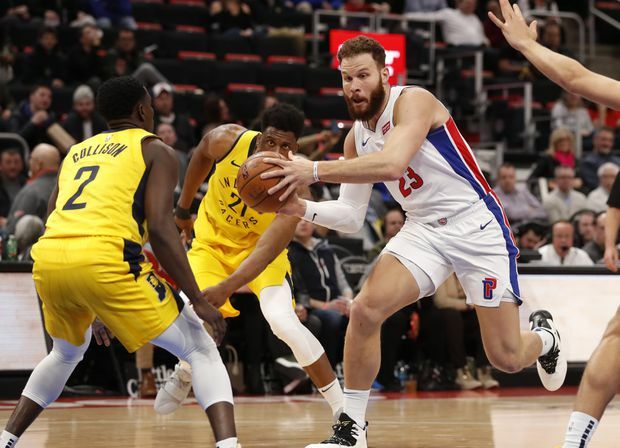 The Pistons grabbed the lead early in the first quarter and didn't relinquish it, though the Pacers battled back from a 17-point deficit to get to within a point in the third quarter. Detroit made 18-of-41 3-pointers. Griffin went 5-of-10 from beyond the arc and finished with 20 points, 10 rebounds and 10 assists. Reggie Jackson and Wayne Ellington scored 14 points each. Luke Kennard (19 points, 5-of-3 threes) and Langston Galloway (13 points) provided kick off the bench. Bojan Bogdanovic led Indiana (40-21) with 25 points. Domantas Sabonis scored 23 points off the bench and keyed in the start of their comeback in the second quarter before leaving with an apparent foot injury late in the game. The Pacers had lost eight of nine, refusing to fold without Oladipo. They had lost in a row without Oladipo before going 8-2. The Pistons made 10-of-22 3-pointers. Kennard led the way, going 4-of-6 from beyond the arc, and scoring 14 points. Sabonis heated up in the second quarter, scoring 12 of his 16 first-half points.